Fresh off her SA Live segment, Vanessa Cruz strolled through Pearl Brewery with an iced coffee in one hand and a stack of large vibrant paper flowers in the other. Perched on top of the handmade flowers was a Fiesta-ready floral halo, each flower a miniature replica of the ones the halo rested on. With her growing business Forever Petals by Vee, the flowers and halo are only a sample of the work Vanessa can do as a paper florist. Forever Petal by Vee’s Vanessa Cruz. Photo by Selina Bonilla. Forever Petals by Vee began in 2015 after Vanessa participated in the Dia De Los Muertos Festival’s altar contest to honor her grandparents. For the altar, Vanessa created giant paper flowers to adorn two large crosses—it was her first time attempting to make paper flowers at such a grand scale. 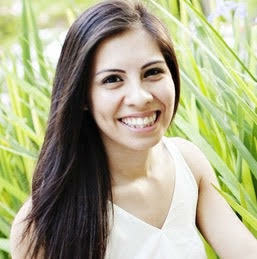 “That event really allowed me to see the appreciation there was for the art of paper crafting,” Vanessa said. 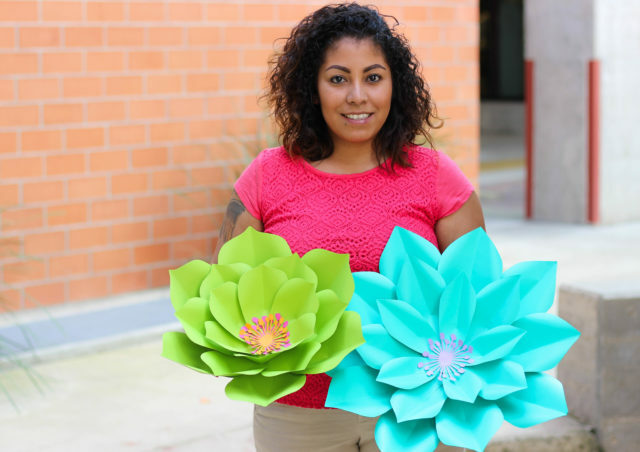 After deciding to go to school full-time, she left her job and focused all of her free time creating large paper flowers. Prior to the Muertos Fest, Vanessa was no stranger to paper crafting. In fact, she began perfecting her origami in 2009. With the help of YouTube, Vanessa progressed from making origami roses and cranes to full flower bouquets that she sold seasonally. At that time, it was never about making her hobby into a full-time business. “There is a demand for it, but at the beginning, I had always thought, ‘is this just a trend?’” she explained. After nine years of paper crafting, she no longer has that worry. 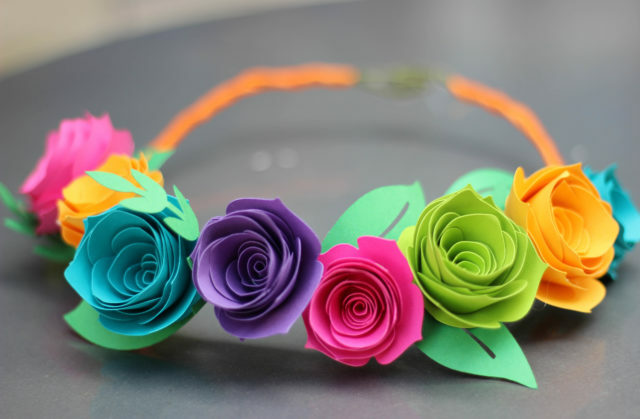 Fiesta floral halo. Photo by Selina Bonilla. 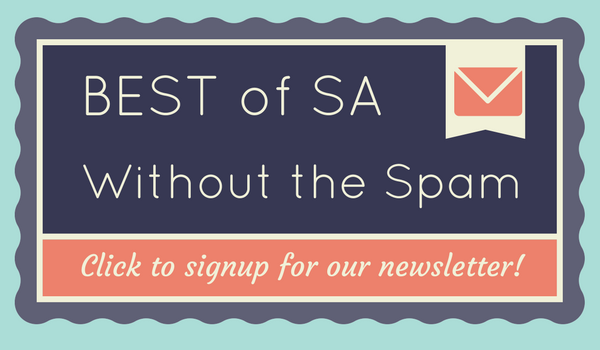 With Fiesta well on its way, April has been Vanessa’s busiest month. 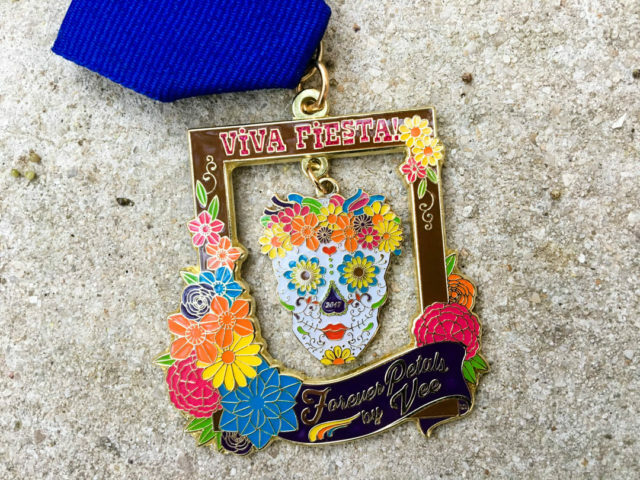 Along with creating Fiesta halos and renting out paper flower backdrops for events, Forever Petals by Vee released its first Fiesta Medal this year. Her Fiesta Medal design incorporates her love for sugar skulls—a subtle, unintentional nod to her business’s Dia De Los Muertos roots—and her iconic colorful flowers on a wooden frame. Her medal was a huge hit during her presale and now, she only has a limited amount left. Forever Petals by Vee 2017 Fiesta Medal. Photo by Garrett Heath. But in the meantime, Vanessa continues her work, whether it’s making an arrangement for a nursery or encouraging her social media followers to pursue their goals—no matter how unconventional they may be. “If you want to craft, I encourage you. Do something you love,” she said. 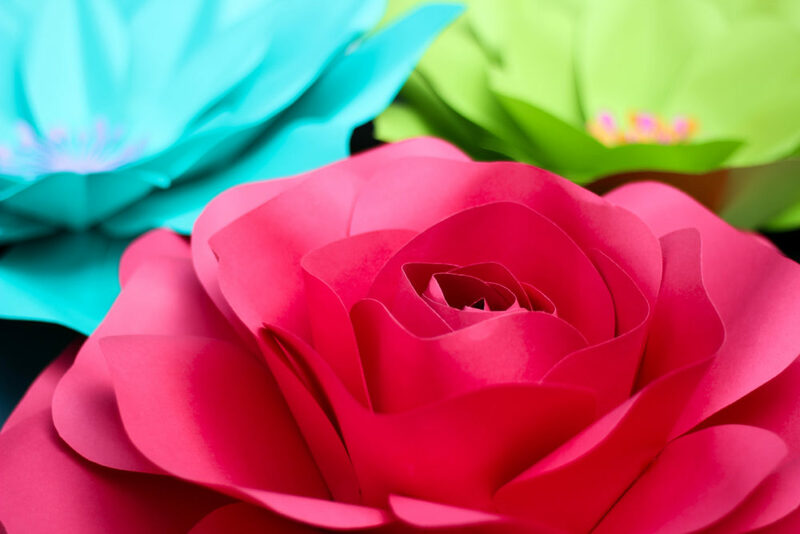 On top of offering private party paper flower classes, Vanessa is on a venue hunt to host classes for the public—something many of her customers have been requesting. 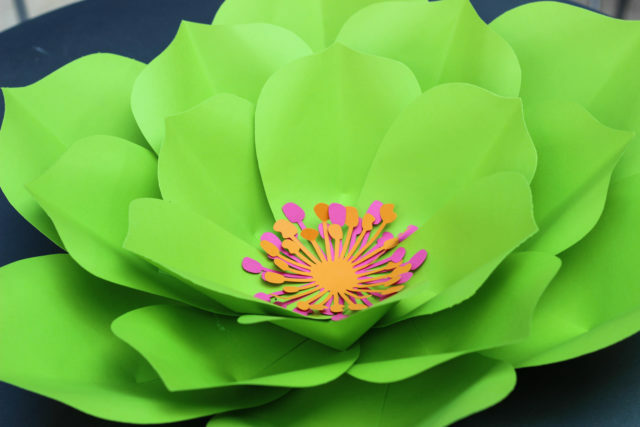 She has also recently released flower templates on her Etsy shop to allow her customers the ability to learn the craft in the comfort of their own homes. Forever Petals by Vee has released flower templates on Etsy. Photo by Selina Bonilla. “I am very community over competition and I use that hashtag on social media,” Vanessa said. “I get a lot of question about people wanting to start but don’t know where, and I encourage them to feel free to ask me questions.” She wants to be a resource for her community just as other paper florists across the nation were to her thanks to social media. Forever Petals by Vee’s rose inspiration comes from @annnevilledesigns. Photo by Selina Bonilla. When she is not making flowers for her business, she is still crafting with her son and daughter. She enjoys spending quality time with them and is pleased to see that they inherited her craft-loving gene. For a full-time student, mother and business owner, juggling all her responsibilities may not always be a “walk in the park” per se. But for Vanessa, the park is her home—full of paper floral arrangements that bring beauty, creativity and passion to her life and her community. 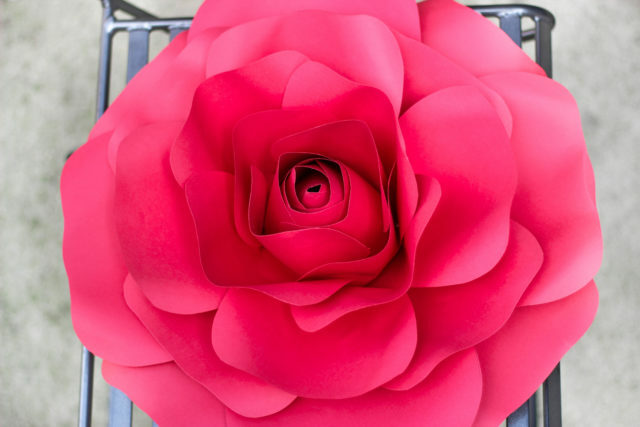 Vanessa’s paper flowers are far from temporary—they’re forever. You can shop and order custom arrangements through Forever Petals by Vee’s Etsy shop, Facebook, or by email.